First, my dad wants everyone to know that he picked out the tile for both bathrooms (he didn't, and if we had a camera crew following us around I could prove that I was the one who spotted the two different tiles while we perused the Lowes tile aisle and said, hey, what about these; they're on sale. And then he said something like, Well that's a thought.). Regardless, he would like some recognition for his design choices throughout the house, including the beautiful marble backsplash (which, if you ask him about it, he'll regale you with the tale of Michaelangelo picking out the imperfect piece of marble in the quarry with which he made David), which I have not yet taken a picture of. Yesterday my phone was wonky and I didn't take pictures of anything because the battery kept dying and I was getting texts from Verizon that I was out of data, yadda yadda yadda. But anyways, let's acknowledge that my father is also a design genius (as if that was really in question). Okay, so yesterday was a lovely almost 60 degree day at Graceland. As we're in the final push, I figured an extra set of hands would go a long way, so I asked my bestie Olivia to come help out. 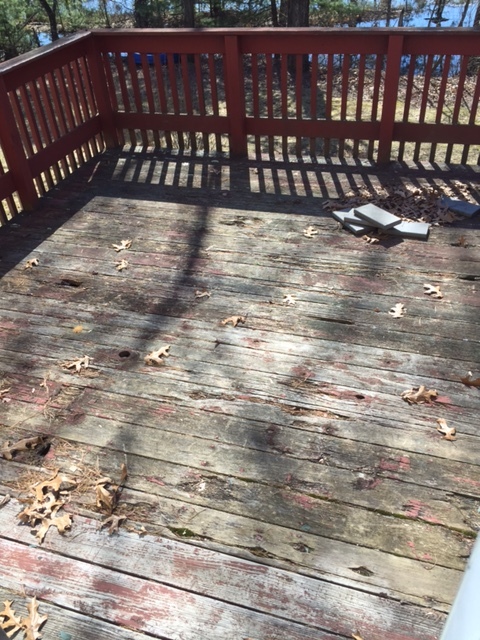 As it was nice out we decided to tackle dismantling the rotting deck. 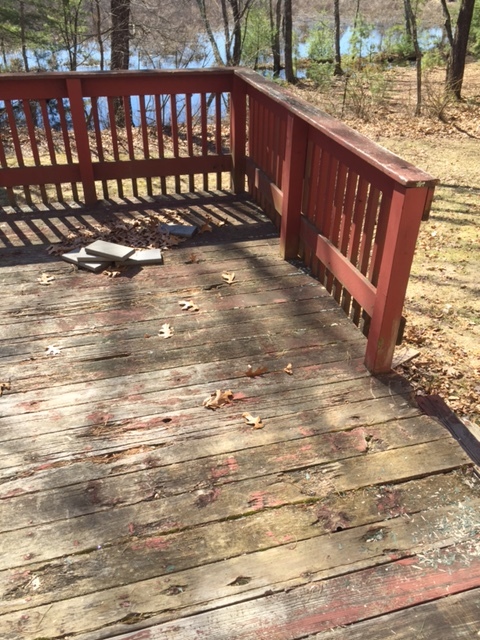 A new deck will be built, but in order to do that we had to take the original apart piece by piece. First, we took down the railing. Olivia dismantled the far side stairs while I pulled up as many nails as I was able. Then with crowbars and good ole elbow grease, we pulled up each board. I don't know why I thought we would be done by lunchtime, but it took us the entire day. And I neglected to take a picture once we'd finished. Suffice it to say we are both incredibly sore from throwing our entire bodies into tearing up those boards. But what better way to spend the day than hanging with your bestie, listening to music, and getting a great workout? So then once we'd high fived (oh god Liv, did we forget to high five??) we headed inside to see what my dad and Larry had been up to. Larry was replacing the tread on the stairs and my dad was starting the kitchen backsplash (pictures to come later). 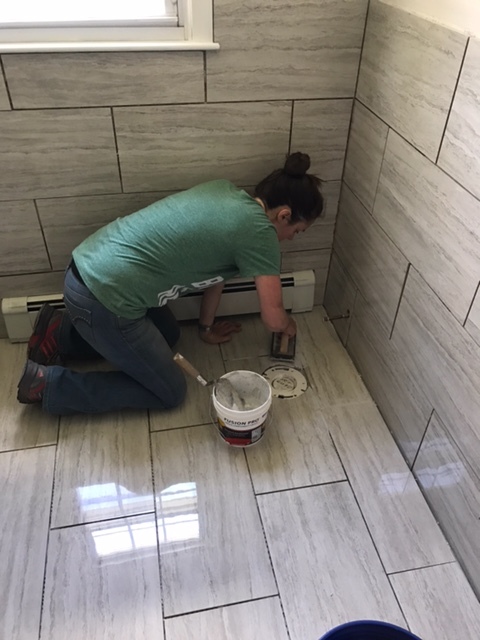 Before we headed back to the city I offered to teach Olivia to grout. She was a natural! There is so much more grouting to be done so tomorrow I will either be tackling that or continuing the horrible game of painting trim. Uuuuuuuugh. But we're getting close, so close. I love so much about this post. You, your dad, Larry, Liv and the whole crew are making such amazing progress! 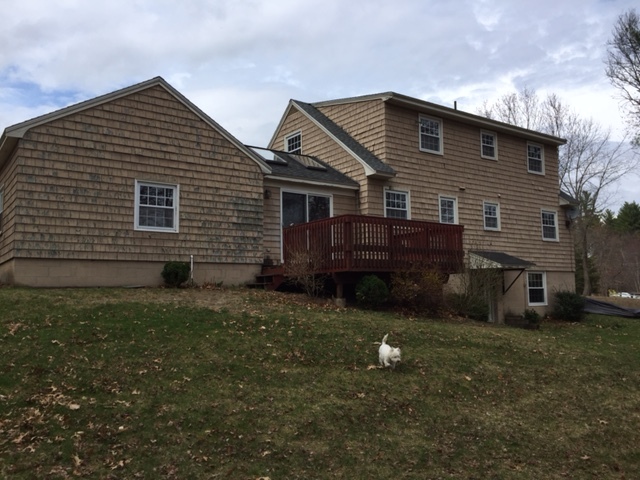 So excited for the final before and after pics. I don't think we high fived physically, but celebratory sodas and chips fulfilled it figuratively. And sorry I didn't think to take a pic of the finished porch with my phone!